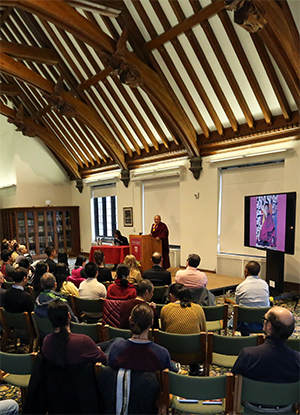 In this talk, Khenpo Sodargye introduced the biography of H.H. Jigme Phuntsok Rinpoche, a great Buddhist master of the 20th century and founder of the Larung Gar Buddhist Academy, one of the most influential Buddhist academies in the world. Even though he was born with amazing talents, H.H. Jigme Phuntsok Rinpoche was committed to rigorous Buddhist study and practice, displaying great respect for his guru. 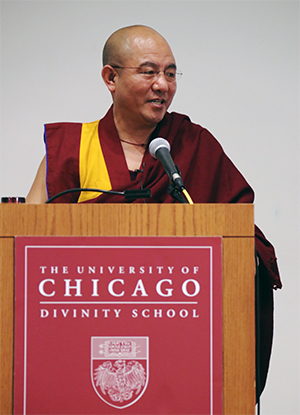 As one of the leading figures in contemporary Tibetan Buddhism, H.H. Jigme Phuntsok Rinpoche made many great contributions, graciously spreading the Dharma to many parts of the globe. I believe that our teachers and parents are the individuals who have the most influence on us over our lifetimes. In China, there is an old saying: “A day as a teacher, a lifetime as a father”, meaning that even if someone is our teacher for just one day, we should regard that person like we would our father for the rest of our lives. In this impetuous era, people seem to be extremely busy, impulsive and reckless. H.H. Jigme Phuntsok Rinpoche has provided us with many short and simple, yet profound, teachings which are especially suitable for use in this modern age. If you have a chance to read any of them, please cherish them and you will enjoy their many benefits. From my perspective, Buddhism is actually a spiritual science, but can also be referred to as cognitive science. These days, much scientific research focuses on the material or external world. However, where spiritual science is concerned, there is not nearly enough emphasis. As humans, we need scientific research that studies both our inner (cognitive) and outer (material) worlds, and I believe that Buddhism can provide many contributions to the spiritual aspects of scientific research. Many Buddhists prefer to receive empowerments and attend Dharma Assemblies with a lot of rituals rather than to listen to teachings. Actually, as Buddhists, we must study the Dharma and understand the stages of the path to enlightenment in a systematic way. Otherwise, our emotional faith will be temporary, changing at any time. Therefore, we encourage intense, long-term Buddhist study in order to establish a solid foundation upon which to build steadfast faith. Only with enough learning, attending Dharma Assemblies or rituals can become meaningful. Both faith and right views are essential for Mahayana and Vajrayana practices, but if you want to fully assimilate these teachings, faith is key. If you have faith, you will respect and cherish both the Dharma and the guru who teaches it. However, if you have no faith, treating your guru as an ordinary person and the Dharma as ordinary information, you will not appreciate it as much as you otherwise could have. As a Buddhist, whether you are from the East or the West, having devout faith in the teachings of Buddha is extremely important. From my perspective, Buddhism is actually a spiritual science, but can also be referred to as a cognitive science. As humans, we need scientific research that studies both our inner (cognitive) and outer (material) worlds, and I believe that Buddhism can provide many contributions to the spiritual aspects of scientific research.